Oh boy, where do I start with this one. The Subaru WRX is definitely not for the faint of heart. The STI takes it up a notch and is even more polarizing. If you’re into World Rally Car racing, you’ll love it. If you’re not into lots of protruding body panels, huge air scoops, and a rear wing that makes your car look like it just received clearance for takeoff on the U.S.S. 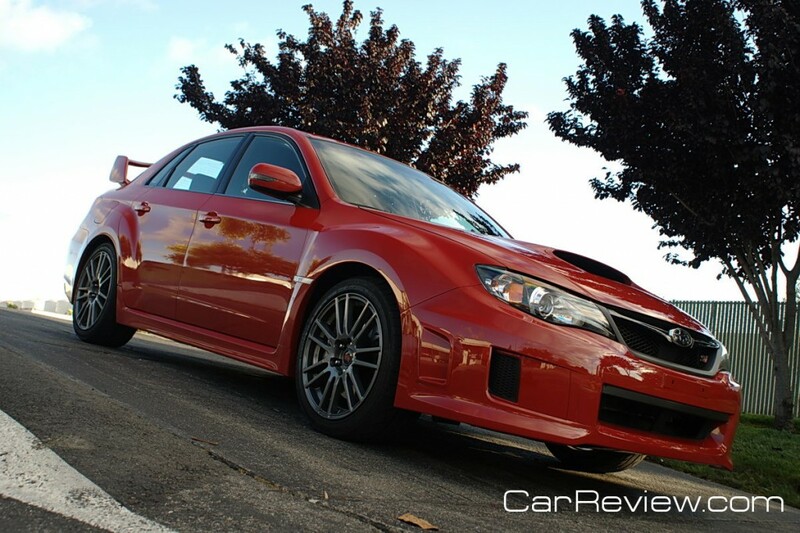 Enterprise, the WRX STI is probably not what you’re looking for. I definitely felt a bit awkward getting in and out of the WRX STI in parking lots. My wife felt a bit embarrassed when I picked her up in front of a store. It’s definitely a boy racer type vehicle, and you expect some high school kid to climb out of the driver side. But high school kids can’t afford the WRX STI. The problem is that most people won’t know that, as they have no idea the WRX STI Limited costs around $37k. So chances are they think you drive a subcompact and blew a bunch of money on a fake air intake and a huge wing on the trunk to try and look cool. 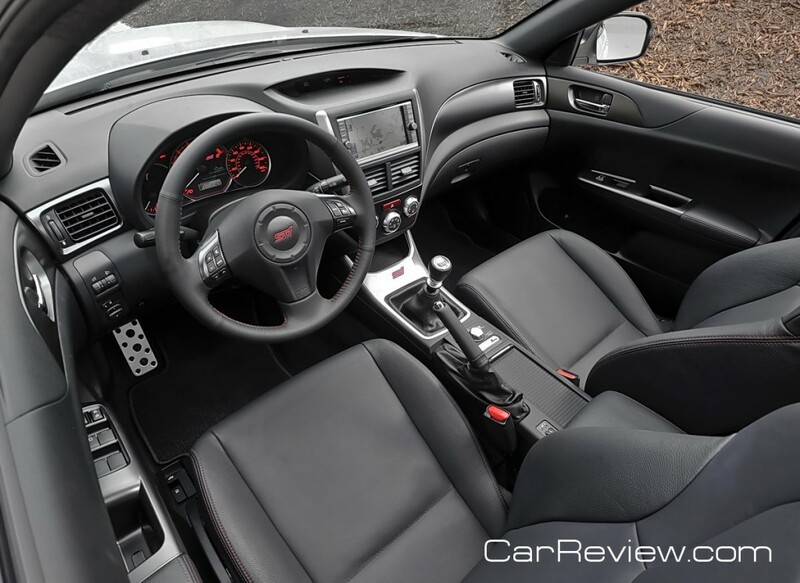 Let’s make one thing clear: one does not buy the Subaru Impreza WRX STI for interior comfort. The STI Limited is pretty well-equipped, with Bluetooth, touch screen nav, etc. etc., but the design is “meh” and the plastics feel cheap to the touch. This is the exact opposite of an Audi interior. The Limited has leather/suede seats, which are nice, but that’s not why you buy the STI. I found the seats supportive enough and controls were within easy reach. I’m not a big fan of the touch screen nav layout and the screen is hard to see in direct sunlight. The steering wheel-mounted cruise controls and audio controls are fairly straightforward, and pretty standard these days. This interior is definitely not what you’d expect in a $37k car, but most of that money went into things you can’t see on the interior, like the engine, suspension, and the symmetrical AWD system. You can only experience them while you’re barreling down an unpaved dirt road at over 60 MPH. 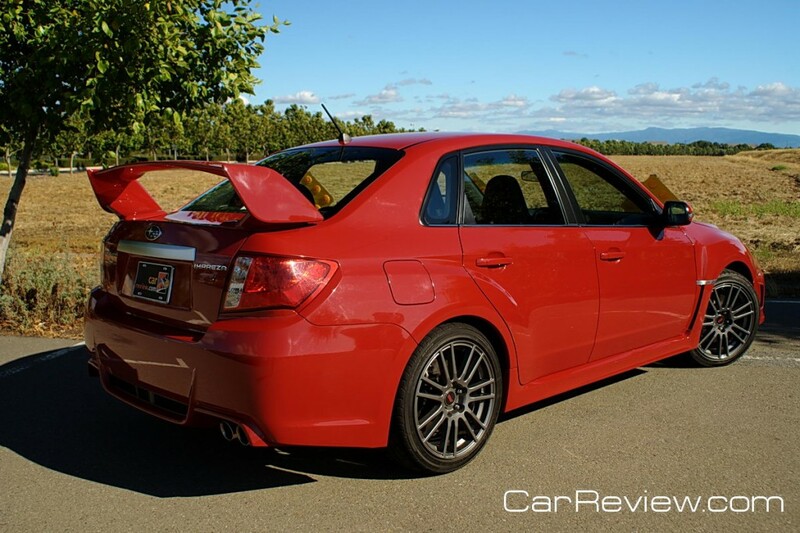 The WRX STI is competitive with the Mitsubishi Evolution MR both in terms of performance and pricing. The Subaru has a bit more horsepower compared to the Mitsubishi Evo, but on the whole the two are well-matched. I think it’s kind of like choosing sides between the Coke and Pepsi wars. Except with a lot more money at hand. The STI, starting at $33,995, is significantly more expensive than the WRX (starts at $25,495), which has 265 HP instead of 305, but slightly better MPG (19/25 vs. 17/23). The difference is almost ten grand, depending on the trim of the WRX and the STI you select. You don’t get the driver controlled center differential, SI-Drive and some other goodies, but you get the same aggressive styling and most of the performance.